« Marty McInnis – You Couldn’t Get That Puck Away from Him! September 17, 2012 came and went without fanfare. That’s unfortunate. It was the 225th anniversary of the signing of the United States Constitution. Constitution Day is one of the least-acknowledged events on America’s calendar, and it just shouldn’t be that way. Don’t take it from me. Let George Washington remind you of how significant the completion and ratification of the Constitution was. As president, he issued a proclamation – to accompany a resolution of Congress – declaring November 26, 1789 as the first Thanksgiving Day. It was to give “thanks” for the new Constitution. We should be thankful for it as well, and September 17 of each year should be an occasion of thoughtful and appreciative reminiscence, if not a national holiday. I’d like to take this occasion to belatedly raise a glass in salute to one of the most unsung heroes of early America, and the most important influence on the final form of United States Constitution, the remarkable Gouverneur Morris. Our Constitution has a total of 4,440 words. 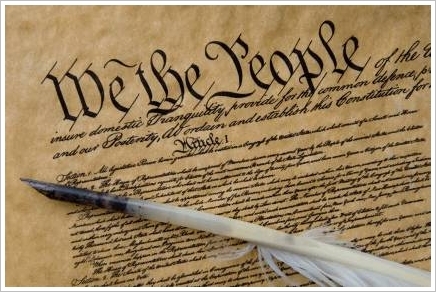 It is the oldest, and the shortest, written Constitution of any major government in the world. Every word of the Constitution counts, especially “We the People,” the mighty and telling first three words of the Preamble. Those were the words of Morris, the wealthy, womanizing aristocrat from New York. He did much, as one of the Founding Fathers, to help bring forth the new nation. Those three words were his greatest gift to us all. Gouverneur Morris actually disdained democracy. That word, in fact, does not appear in the Constitution. 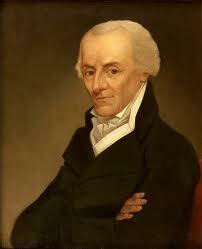 When Elbridge Gerry of Massachusetts remarked, at the Constitutional Convention, that “The evils we experience flow from an excess of democracy,” Morris agreed. He thought that only landowners should be allowed to vote; a broad voting franchise would entrench the rich in power, in his view. So how did that man fashion the enduring document that has secured the rights of all individuals for the past 225 years? He was on the right side of all the issues that truly mattered. He was an ardent nationalist; he believed that the only hope for survival of the new country was for it to be bound together as one nation, not a confederation of sovereign states. He also hated slavery, and he was a passionate believer in freedom of religion even though he was no churchgoer himself. As one who writes and edits for a living, I am a big fan of Morris. My earlier blog post, which you can read by clicking here, recaps his life and career. There’s no need to repeat it. But since I did that post, I have read Richard Brookheiser’s biography, “Gentleman Revolutionary: Gouverneur Morris, the Rake Who Wrote the Constitution.” The book describes how Morris’s skills as a writer and editor brought the Constitution into being. William Samuel Johnson, Chairman of the “Committee of Stile.” He delegated the committee’s responsibilities well. Morris was the star performer on the “Committee of Stile,” a group of five men selected by a Committee of Detail to “frame” all of the resolutions that the entire convention had approved. The chairman of the committee was Dr. William Samuel Johnson, a 60-year old lawyer from Connecticut. The others were Rufus King, Alexander Hamilton, and James Madison. Only one could do the writing, though, and they delegated it to Morris. He completed his redraft in four days. Morris compressed the first draft’s 23 articles into seven. He followed faithfully all of the resolutions, but his editing eliminated superfluous wording and added clarity and simplicity. Here is just one example, from Article 1, Section 10, in which he reduces the word count from 61 words to 36. So it was throughout the redrafting. Though he was a lawyer, Morris avoided the excess verbiage that lawyers seem to love. His rewording was invariably concise, direct, and clear. But the Preamble was the one place where he did not have to follow any resolutions. Instead, he wrote it from scratch. Rather, he rewrote it from scratch, and in so doing he made clear for all time that the powers of the government derive ultimately from the people. He also pointed out the purpose of the government that was being formed, which the Committee of Detail had neglected to do. This wasn’t good enough for Morris. It was, first of all, a roll call of states. It also neglected to say what the ends of the government were, or why it existed in the first place. And you know how he fixed it. Elbridge Gerry, Massachusetts delegate who refused to sign the Constitution. “We the People of the United States…” begins his preamble. It’s not the 13 states that are the source of legitimacy and power of the government. It’s the people of the entire nation. This was Gouverneur Morris’s statement of nationalism, and his lasting bequest to us. The style is poetic even while it remains spare. The subtle rhymes of “insure/secure” and “tranquility/liberty/posterity” along with the alliteration “provide/promote” give the Preamble an appealing and memorable ring. “We the People” are establishing this government, and here’s why. The government that Morris and his fellow conventioneers built and secured with that Constitution has endured for more than two centuries. It will continue as long as “We the People” elect representatives who carry out the mission of the government as stated in the Preamble, who act in the interests of the entire nation. There is no guarantee that we will do that. Our record over the past several decades is mixed at best. This entry was posted on September 25, 2012 at 11:55 am and is filed under Events and Society, Words. You can follow any responses to this entry through the RSS 2.0 feed. You can leave a response, or trackback from your own site.